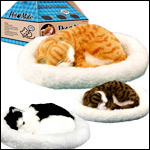 These are cool, the FurReal breathing pet cat. It looks, feels and breathes just like a real moggy, but instead of sleeping for 18 house a day it sleeps the full 24. You can get the FurReal breathing cat from Latest Buy for ~£17.00, available in Ebony Black, Ginger Brown and Tiger Orange. Hey. Thanks for this info. I’ve read about this from other people’s view and opinion. I also have came across a website (firststreetonline) selling this gadget also. The name for the product is ZZZ animals. Thanks for sharing.